Dr. Cullen Buie is an Associate Professor and the Esther and Harold E. Egerton Career Development Professor in the Department of Mechanical Engineering at the Massachusetts Institute of Technology. He received his B.S. in Mechanical Engineering from The Ohio State University and his M.S. and Ph.D. in Mechanical Engineering from Stanford University. Afterwards, Cullen was awarded a University of California President’s Postdoctoral Fellowship to conduct research at the University of California-Berkeley. Cullen joined the faculty at MIT in 2010. He has received many awards and honors in his career, including the Presidential Early Career Award for Scientists and Engineers, the DARPA Young Faculty Award, the DuPont Young Professor Award, and the NSF CAREER Award. 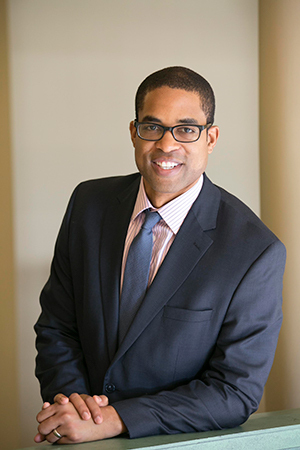 Cullen was also named a Stanford Distinguished Alumni Scholar, and, in 2016, Cullen was named one of the 100 Most Influential African Americans by The Root. Cullen is joining us to give us an inside look into his life and science. When he’s not working, Cullen likes spending time with his wife and three kids. He takes advantage of down time to catch up on sleep and also to indulge in watching stand-up comedy. One of his favorite comedians is Jim Gaffigan. Cullen is also a big college football fan, and he is always rooting for the Ohio State Buckeyes. In Cullen’s lab, they are working on a variety of projects that involve putting new nucleic acids or DNA into cells. For the most part, they use bacteria or other microbial cells and insert DNA that allow the cells to produce different things. “Do or do not, there is no try.” – Yoda. Early on, Cullen was really into sports and wasn’t especially interested in science or engineering. He played basketball and football in high school and had aspirations of pursuing a career related to athletics. Despite this, Cullen demonstrated an aptitude in science, and he took many advanced courses over the years. When he was preparing to go to college, he declared his major originally as pre-med since his sister was in medical school, but he was actually still undecided. Cullen went with his family to the Ohio State University campus to pick his younger brother up from a football camp over the summer, and while Cullen was there, he was able to meet with people on campus who introduced him to the field of engineering. Just a few days later, Cullen was back on campus and enrolled in a summer program that began his formal engineering education. Cullen considered many different career paths such as start up companies, industry positions, national laboratories, and consulting before deciding to become an academic professor. For him, academia was a place he could best integrate all of his skills, talents, and passions. In Cullen’s first term in graduate school at Stanford, he was surrounded by brilliant students who were all coming in with different levels of experience. He quickly realized that he was behind compared to where he needed to be, and Cullen struggled with all of his classes that first semester. At the end of the semester, he went home for winter break. Cullen wasn’t happy with his grades, and he spent time updating his resume in case he didn’t make it through the first year and needed to find a job. When he returned to school, Cullen consulted with people in his lab to learn tips on studying for his courses, and things gradually got better. During his second and third years on the faculty at MIT, Cullen experienced a drought in funding. He received 10-12 consecutive rejections of grant proposals, and he was starting to worry about his ability to maintain and progress his scientific career. One day, he confessed to a small group of fellow faculty that he was struggling with funding, but he decided to rely on his faith and trust that everything would work out okay. Cullen came to terms with the possibility that he may not get tenure, and that even if that came to pass, it wouldn’t be the end of the world. That same day, he received an email regarding a grant he had applied to. It started off like every other rejection letter. His heart sank. As he kept reading, the realization began to sink in that this letter was congratulating him on his grant being selected for funding! This was an exciting success that helped turn things around for him. There was a microfluidics Gordon Research Conference held in Italy in the mountains about an hour outside of Pisa. Cullen flew into Rome and was able to visit with one of his friend’s brothers who lived there. It was wonderful to have a local resident guide him through some of the sites. One of the most memorable places he saw was a prison where it is believed the Apostle Paul was held captive. Cullen also marveled at the impressive mix of ancient sites and modern buildings woven throughout the city. The conference was a phenomenal experience because Cullen was able to meet and get to know many of the scientists whose research he had been following for years. Cullen enjoys planning social outings with his lab group. Recently, they all went to a karaoke bar together. Music is one of those things everyone seems to like, and people really got into it. It was great to see a different side of the people in the lab as they, sang, danced, and had a fantastic time. What will really distinguish you as a researcher is picking a good problem to work on. Also, it’s important to consider the big questions in life because they permeate everything you do. Often, people don’t contemplate these questions until they experience a tragedy that forces them to think about these big issues. Taking the time to reflect on the big questions like why we are here and what is the meaning of life will affect how you live your day-to-day life and prepare you for dealing with the difficult times we will all inevitably face. Cullen’s graduate work involved water management for hydrogen fed fuel cells and fuel delivery for direct methanol fuel cells. Cullen obtained his Ph.D. in Mechanical Engineering from Stanford in January of 2009. Prior to joining MIT, Cullen was a President’s Postdoctoral Fellow at the University of California, Berkeley working with Professor Liwei Lin at the Berkeley Sensors and Actuators Center (BSAC). Cullen is currently an Associate Professor of Mechanical Engineering and the Esther and Harold E. Edgerton Career Development Chair at MIT. His laboratory explores flow physics at the microscale for applications in materials science and microbiology. His research is applicable to a diverse array of problems, from anti-biofouling surfaces and biofuels to energy storage and bacterial infections. Here is a recent article from Cullen’s group published in the journal Nature that describes how raindrops can help bacteria in the soil disperse into the air.